The opening exchanges were all Newcastle and with five minutes on the clock a Liam Finn feint and long pass found Alex Clegg who was able to cross in the corner and ground. Finn managed to sneak the ball over the crossbar from the left touchline for the home side to take a 6-0 lead. Doncaster eased themselves back into the game when Connor Bower picked up and grounded Jordan Howden’s grubber kick to the corner. Matty Beharrell hit the near upright with his conversion attempt, the visitors still two points adrift. Misi Tualapapa benefitted on twenty-five when Remi Marginet evaded the Doncaster defence, beating his man to put his centre away doen the right wing to score in the corner. Finn was unable to add the extras into a strong wind. A great break downfield from Alex Rowe saw him tackled ten short of the line. A fast play the ball saw Lewis Young jink through the line to ground under the tackle. Finn slotted his conversion between the uprights for 16-4, Newcastle opening up a comfortable gap. Just before the interval Newcastle were in again, taking the most of a repeat set, when Marginet was involved in the move twice before putting Mo Agoro free to go over in the corner. Finn was again accurate with the boot, using the wing to assist his kick over for a half time lead of 22-4. Within ninety seconds of the restart Doncaster announced that they weren’t herte making up the number when Jordan Hedges took a bullet pass from Karl Kesik to crash over in the corner. Beharrell pushed his kick between the posts, his side now 10-22 behind. On fifty-three determination from Jason Tali, pushing off three tacklers , to go over from ten metres to score. Beharrall kicked the conversion from under the sticks, the visitors now back within six of their hosts at 16-22. Three minutes later and Doncaster withing two. A superb long pass from Beharrell found Matty Chrimes on the wing who stepped off his left foot and went over. Beharrell couldn’t add the extras but the second half had been all Doncaster. A superb 40-20 from Beharrell gave the Dons excellent field position and after a quick tap Jordan Howden went through a pedestrian Newcastle defence to score and take the visitors into the lead. Beharrell added the conversion, wind assisted, for 26-22. The game was in the bag for Doncaster on seventy-five after Kesik stepped out of an attempted tackle to roll over the line. Beharrell put his kick directly between the uprights for a ten point lead at 32-22, twenty-eight unanswered sscond half points. Two minutes later Kesik was sin-binned for a clumsy late challenge which resulted in Howden being helped from the field. Alex Clegg got a very late consilation for Thunder, Finn electing not to kick for goal with just seconds left on the clock. The final hooter sounded before the restart, the visitors winning by 32-26. This was the archetypal ‘game of two halves’. There was only one side in it for the first half as Newcastle opened up a big 22-4 lead and never really looked in any danger. The second half saw a transformed Doncaster who threw everything that they had at the home side and went on to secure an excellent 32-26 win as the Thunder had no answers. An entertaining start to the Championship One season. Thunder: Young (T), Agoro, Tualapapa, Brown, Clegg (2T), Marginet, Finn (3G), McAvoy, Simons, Aldous J, Ollett, Clarke, Luckley. Subs: Aldous H, Blanke, Carlile, Rowe. 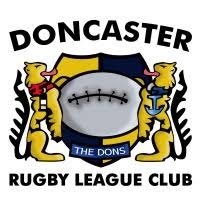 Doncaster: Wynne, Chrimes (T), Bower (T), Tali (T), Doherty, Howden (T), Beharrell (3G), Boyle, Kesik (T, SB on 77), Douglas, Langtree, Foster, Hedges (T). Subs: Scott, Spiers, Dixon, Cross.